Slowpoke is one of a slew of Pokemon memes made popular in the internet site 4chan. The Slowpoke character is often utilized in the presence of a troll (internet kind) who has brought a tired old issue back up for discussion to the annoyance of everyone else. Slowpoke has evolved to be used to refer to anyone who has missed the boat, and who talks about anything that has become history or old hat. Topical issues that are no longer topical get called out by use of the Slowpoke graphic. 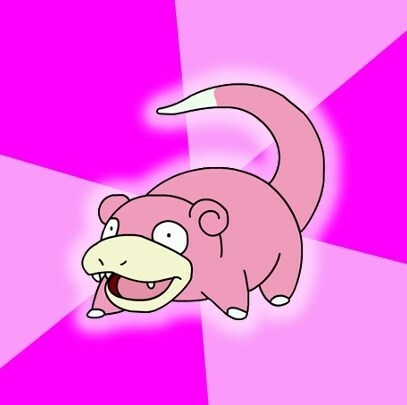 For example, Slowpoke is used when someone posts about something that was a huge topic in the news … three months ago. It is meant to chastise the person for being behind the times and not with it. Many people have either known this person or been this person, where there is some sort of joke that they are just a few seconds (or minutes or months, in the internet’s case) behind in getting. Yet again this taps into a universal experience that most people have had at one time or another. The Slowpoke graphic has evolved into a meme, where a graphic of the character Slowpoke is used with accompanying text calling out whomever or whatever for being old news. Often the subjects of discussion are not-so-recently dead celebrities such as Michael Jackson. Notable examples of Slowpoke include the picture with the text: “Someone – should totally stop Hitler”, “Guys! Amy Winehouse died”, and “Guys! Terrorists flew a plane into the World Trade Center”. i can haz level 100?